The parish of Longham is located in Breckland, northwest of Dereham and northeast of Swaffham. Its very straight eastern boundary roughly follows the line of the Launditch (NHER 7235), while parts of the northern boundary follow the route of a Roman road and the Bittering Stream. Longham village, a linear settlement on the edge of the former Kirtling Common, is located in the east. There are a number of scattered farms and buildings, including those at Longham Hall, Hall Green and on the site of Wendling Airfield. There has been a reasonable amount of fieldwalking, some metal detecting has taken place and stray finds have been reported. Gravel quarrying in the northeast has resulted in field surveys and excavations. Site visits have also been undertaken and some historic buildings survive. Although sites have been recorded throughout the parish, quite a few areas have not been examined and consequently there are gaps in our knowledge. Prehistoric flint artefacts have been found at a number of sites. They include Mesolithic artefacts, flakes, scrapers and part of a Neolithic polished flint axehead. In the northeast excavations have revealed important evidence for Neolithic and Bronze Age settlement (NHER 7239 and 13025). Features discovered include Neolithic pits and groups of Later Neolithic or Early Bronze Age pits, while the artefacts collected include pottery sherds and worked flints. 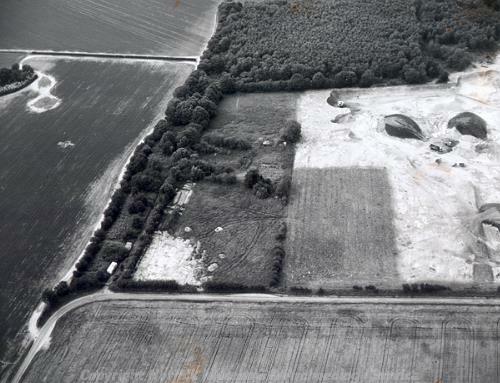 One of the Neolithic pits was dug into the remains of a pingo (a mound created by natural periglacial activity) known as the Longham Mound. Further settlement evidence has been discovered directly to the north in Beeston with Bittering parish (see NHER 13023, 15910 and 15995). During the 19th century a Bronze Age barrow (NHER 7237) was flattened and a number of pottery urns were collected. Unfortunately the location of the barrow is unknown. It is possible that an undated ring ditch (NHER 11697) situated close to the Longham Mound is the remains of it, although the ring ditch could also be the remains of a second Bronze Age barrow. A Bronze Age socketed axehead was found in the 19th century, although exactly where is uncertain. Excavations on the site of the Neolithic and Bronze Age settlement also discovered evidence for an Iron Age settlement (NHER 7239 and 13025). A square enclosure (a possible barrow), a four post structure and pits have been recorded and pottery and iron working debris are amongst the finds gathered. The settlement continued northwards into Beeston with Bittering parish (NHER 13023, 13923 and 15910). The only recorded Iron Age artefact discovered away from the settlement is an Iron Age terret, part of a horse harness, from a garden in Longham village. The course of the Launditch (NHER 7235) forms the western parish boundary. In the northeast, as in Beeston with Bittering and Mileham parishes to the north, it survives as a substantial ditch and bank. However, for most of its route it is only identifiable in field boundaries, map evidence and on aerial photographs. In the mid 20th century it was suggested that the Launditch is Early or Middle Saxon in date and an excavation in 1954 appeared to confirm this. More recent excavations, however, have opened up the possibility that it could date to the Iron Age. Whether it is Iron Age or Saxon in date, it would have been part of a larger defensive system. The Launditch is intersected by a northeast to southwest aligned Roman road (NHER 2796). 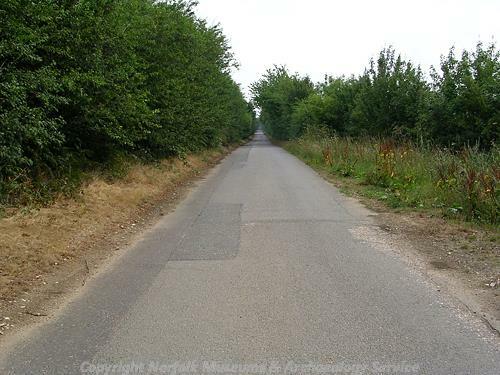 This is the road between Denver in west Norfolk and Brampton near Aylsham. A few Roman objects have been discovered, including coins and fragments of pottery. Pottery collected from the Longham Mound suggests that it may have been a focus for activity during the Roman period. Metal detectorists have discovered an Early or Middle Saxon brooch in the southeast. A large quantity of Middle Saxon and Late Saxon pottery (NHER 7269) has been found during fieldwalking in the west, directly south and east of the St Andrew’s Church. This concentration of pottery suggests that during the Middle Saxon and Late Saxon periods the church site was located within a settlement. It is possible that a church was built during the Middle and/or Late Saxon period and although the current building contains no Saxon elements, Middle Saxon pottery has been discovered in the churchyard (NHER 7277). A Late Saxon harness mount comes from the northeast (NHER 13025). During the Late Saxon period the system of local government based on hundreds was established. The Launditch gave its name to the surrounding hundred and it seems likely that the hundred court met at a site in the northeast (NHER 13025). A 16th century map shows a pair of gallows here, possibly indicating the site’s continued use as a court meeting place. In the Domesday Book of 1086 Longham is called ‘La Wingham’. This Old English name means ‘the homestead of Lawa’s people’. A freeman, a villager, a smallholder, part of a plough, meadow, woodland and pigs were recorded, as was a link with the King’s manor of Mileham. Most of St Andrew’s Church (NHER 7277) dates to the 14th and 15th centuries, although the chancel was rebuilt in about 1890. Today it stands in a relatively isolated position in the west, although this has not always been the case. Medieval pottery and post medieval building material collected from the site of the Saxon settlement (NHER 7269) indicate that it continued to function, and rectangular enclosures visible on aerial photographs to the south and west suggest that it grew during the medieval period. However, by the time a map was compiled in the late 16th century, all of the settlement had been abandoned and the church was isolated. To the south of the church is the moated site of Longham Manor (NHER 7251). Almost the entire moat remains, with fragments of an outer enclosure to the east. The late 16th century map shows a manor house in the centre of the moat with buildings and a pond inside the outer enclosure. 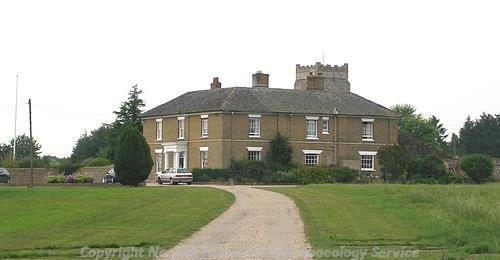 The site was abandoned in 1816 when the occupants moved to Longham Hall (NHER 44625). Further south is a second moated site (NHER 7274), possibly the site of the manor held by Thoman Gunton in 1347. The moat still holds water and has been recut on several occasions. The late 16th century map shows it on the southwestern edge of South Hall Green. Medieval pottery collected along the northern and southern edges of the green suggests that they were occupied, as does the presence of houses on the late 16th century map. Houses are also shown on the map on the north, east and west edges of Kirtling Common. Early 19th century maps and photographs taken in 1946 show a similar settlement pattern. Elm House (NHER 29505) is located on the southern edge of South Hall Green. It was probably built in the late 17th century and was extended in 19th century. Longham Hall (NHER 44625), a brick farmhouse that was constructed around 1840, is sited close to St Andrew’s Church. A pillbox was built during World War Two close to Longham Hall and demolished between 1946 and 1972. Part of Wendling Airfield (NHER 7275) occupies the southwestern corner. The United States Army Air Force used it during World War Two and most of the main runways, a few buildings and a bomb store remain. Some of buildings have surviving paintings. David Robertson (NLA), 18 May 2006.
http://www.historic-maps.norfolk.gov.uk/Emap/EmapExplorer.asp. Accessed: 18 May 2006.